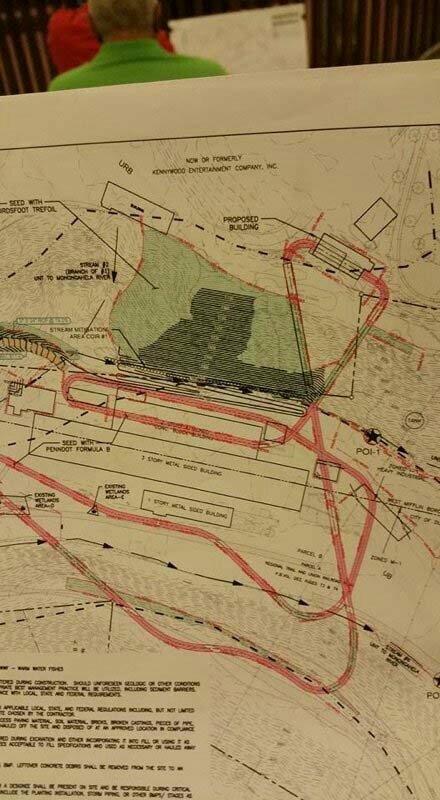 Okay, so after the musings of Alan Schilke visiting Kennywood a few weeks ago, yesterday apparently a layout for a new coaster was proposed at a West Mifflin town meeting. What do you think? 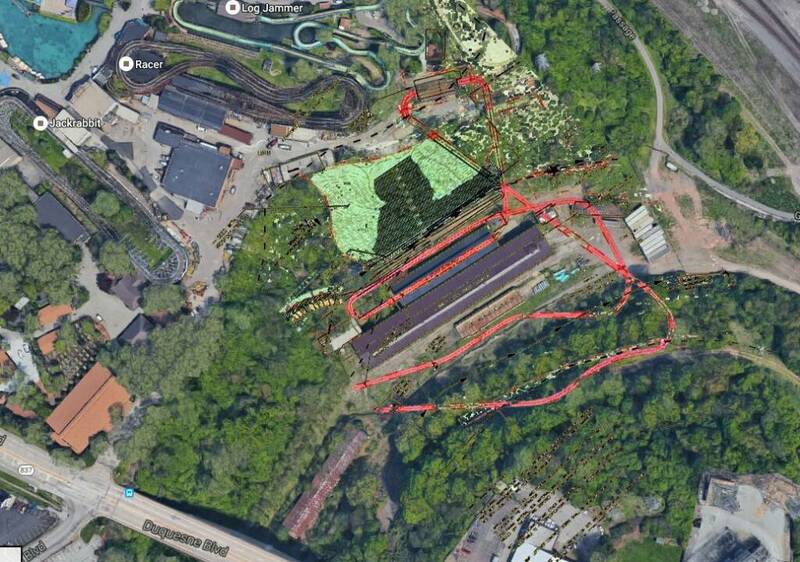 From the looks of the plans it appears to have some sort of dive loop and a huge ravine drop. Unfortunately it looks like it ends on a lift hill Adventure Express style. I'm also a bit confused by what looks to be an impossibly sharp turn in the center of the ride. I still really like the look of it! The rest of the layout is anyone's guess, but the initial drop and the first turn are pretty easy to make out. I'm trying to work out where that is. Is it by Phant's Revenge? I do like it when coasters use the terrain. IMO, that's the best thing about PR. ^No, Phantom's Revenge is the other side of the park. I'm quite excited for this. Agreed that that must be a wave turn, but I'm more curious about the two parallel bits of track towards the end. They're connected by a really tight corner! Very interesting part of the park that is sort of a dead zone. I wonder how they will integrate the ride. The coaster itself will be just fine IMO. RMC! MAKE IT HAPPEN! I've been looking for an excuse to head back to Kennywood and Pittsburgh. Do we know for certain it's RMC or is that just based on the rumor they were seen at the park? Pretty sure all RMC talk is based on that rumor. Although, that first element really does look like a wave turn. 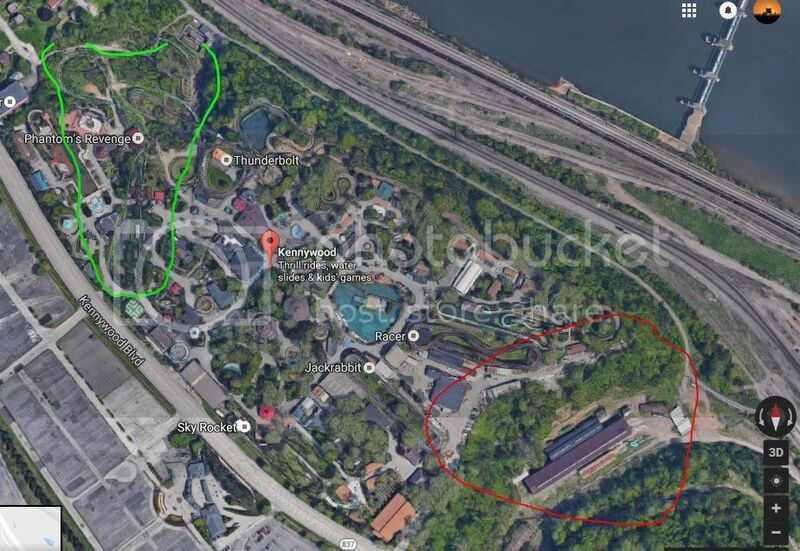 Could the tight corner not be something like the Immelmann thing at the end of Lightning Rod!? ^ I think it'll be that, or some form of dive like the one on Wildfire near the station. It way in the back of the park. The greenish ride you can see about where the station starts is Log jammer then the other coaster is racer. Huh, looks like that'll be a unique Aquatrax layout. I know if you study the plans hard enough you can see hints that this will be an RMC. But I read that the musings of Alan Schilke (sighted) visiting Kennywood was just a rumor. Not that it couldn't happen. I'm just saying I wouldn't give my hopes up on an RMC until an official announcement is made. (See how enthusiasts reacted to Kings Island getting a GCI). Maybe someone could confirm what happened, but I remember hearing rumors not long ago about Palace entertainment wanting to sell their American share. If they still own, would they still want to drop the money on a terrain RMC? I've said it before, I would personally could see KW keeping the money in PA and going with GCI to buuild a nice terrain woodie like they did in China. Just been looking on Google Maps at the elevation difference (well, trying to) and it looks like quite the difference! Apparently the elevation change is around 30 m or so. Sounds about right. I found a Topographical Map and it shows the station at about 900 to 920 feet and the very bottom of the ravine clost to 800' so we could be easily seeing a 100 foot (30 meter) drop out of the station. That would be true Kennywood fashion. CrashCoaster and Zek_Teh_Kek like this. I'm excited for Kennywood, and for what it implies! I don't really get how one extra coaster makes a pattern when three of their other parks are getting new coasters - surely just one of their parks getting a new coaster is the chain allowing new coasters to be built in their parks? Why is it that nobody saw this coming? I missed it too! When you look at the leaked drawing that was posted in this thread, all the buildings are shown except Log Jammer. It was in their plan all along to remove it, we just never noticed it. On a personal note, Log Jammer was one of my favorite log flumes outside of Orlando. I'm sad my kids will never have a chance to ride it.